It is also from this comic strip that the wildly popular Bechdel Test--a test to gauge positive female representation in film--obtained its name. While DTWOF secured Bechdel's role in the comics world and queer community long before her mainstream success, Bechdel now experiences notoriety that few comics artists ever achieve and that women cartoonists have never attained. 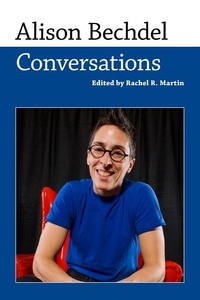 Spanning from 1990 to 2017, Alison Bechdel: Conversations collects ten interviews that illustrate how Bechdel uses her own life, relationships, and contemporary events to expose the world to what she has referred to as the "fringes of acceptability"--the comics genre as well as queer culture and identity. These interviews reveal her intentionality in the use of characters, plots, structure, and cartooning to draw her readers toward disrupting the status quo. Starting with her earliest interviews on public access television and in little-known comics and queer presses, Rachel R. Martin traces Bechdel's career from her days with DTWOF to her popularity with Fun Home and Are You My Mother? This volume includes her "one-off" DTWOF strips from November 2016 and March 2017 (not anthologized anywhere else) and in-depth discussions of her laborious creative process as well as upcoming projects.